Musculoskeletal disorders (MSDs) are injuries or disorders of the muscles, nerves, tendons, joints, cartilage, and supporting structures of the upper and lower limbs, neck, and lower back that are caused, precipitated or exacerbated by sudden exertion or prolonged exposure to physical factors such as repetition, force, vibration, or awkward posture. Costs of MSDs are well-accepted in the industry in developing and developed countries. ,,,, The risk factors of MSDs are divided into occupational and nonoccupational factors. Sedentary work population is prone to various MSDs as there are various risk factors present at the workplace. Disk herniation for sedentary people, who work in a sitting condition is well reported in the literature. , Health and safety executive and European agency of safety and health at work suggest that sedentary work style has an association with the low back pain. , The same concept is also accepted in recent literature. The jewelry manufacturing process is sedentary in nature and requires prolonged sitting occupying the same posture. There are various studies available, which reports that there are risk factors are present, for developing the MSDs, at the workplace of jewelry manufacturing. The prevalence rate of various MSDs is not reported well in literature for the workers engaged in jewelry manufacturing. Even though, large number of workforce is engaged, and the profession is engaged in substantial economic activity, jewelry manufacturing has received very little attention with reference to occupational health related problems, especially MSDs. ,,,,, Therefore, a study need was felt to evaluate the prevalence rate of various musculoskeletal discomfort among the workers engaged in jewelry manufacturing. Minimum 1-year experience in the same job (jewelry manufacturing) was the inclusion criteria for Group 1. Graduate students, who were engaged in the post bachelor study considered as a control group and were selected based on following criteria. The activities are sedentary in nature. Control group: Educational Institutes, Mumbai, India. The study was duly approved by the Institutional Human Ethics Committee, Department of Physiology, University of Calcutta, Kolkata, India. After explaining the purpose of the study and the study protocol, signed informed consents were obtained from all the participants, who participated in this study (workers engaged in jewelry manufacturing and control group). Descriptive and analytical statistics were computed using NCSS, 2004. Nordic musculoskeletal questionnaire (NMQ) was developed by a group of researchers to screen the MSDs as a part of the ergonomic program and epidemiological studies on MSDs. The questionnaire is used for identifying the presence of physical troubles including ache, pain, and discomfort for past 12 months and past 7 days in each of the body parts (neck, shoulders, elbows, wrists/hands, upper back, low back, both hips/thighs/buttock, both knees, ankle/feet). It also evaluates grades of frequency by using a measure of functional status: "How often you get or had (specific body parts) the trouble?." Length of the persistence of the trouble also evaluated by asking "what is the total length of time that you had (specific body parts) trouble during the last 12 months?" Severity of the trouble is also evaluated by using a three-point scale (mild, moderate, and severe). NMQ is used in the present study as it is accepted universally as a screening tool to evaluate the work related MSDs. MSD survey was carried out using modified NMQ  on the workers engaged in jewelry manufacturing and the control group. Annual and weekly prevalence data were obtained and compared for both the groups using statistical software (NCSS, 2004). In the present study, the difference in the prevalence of musculoskeletal discomfort between the workers engaged in jewelry manufacturing and control group were calculated using Chi-square test. The purpose of this part of the study was explained to all the participants. Furthermore, it has been explained to the owners of the jewelry manufacturing units. The responses were obtained at the workplace for the workers engaged in jewelry manufacturing and at the classrooms for the control group. Strength of specific body parts: Strength of back, neck, and knee muscles were measured using preferred method (Appendix 1). Grade represents an examiner's assessment of the strength of a muscle group. The response rates were 81.4% (407/500) and 89.09% (89/110) for workers engaged in jewelry manufacturing and control group respectively. However, 385 (workers engaged in jewelry manufacturing) and 79 (control) results were included in the study as rest of the questionnaires were incomplete. [Figure 1] [Figure 2] [Figure 3] [Figure 4] [Figure 5] [Figure 6] [Figure 7] represent the data of prevalence, frequency, and the severity of the musculoskeletal discomfort among the workers engaged in jewelry manufacturing and control group. 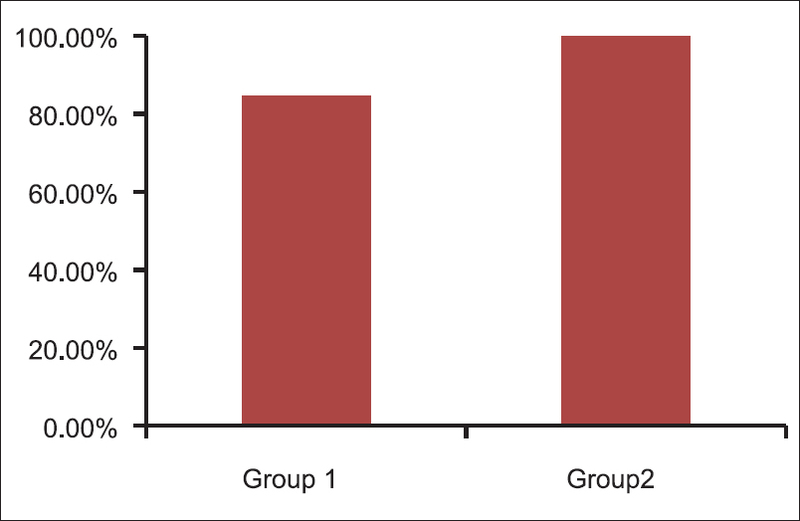 [Figure 1] represents the values of annual prevalence of musculoskeletal discomfort for both the groups (Group 1 - workers engaged in jewelry manufacturing, Group 2 - control). The result revealed that the neck (33.51%), low back (66.49%), and knee (76.10%) were the most affected body parts among the workers engaged in jewelry manufacturing. The percentage of responses for upper back, wrist, shoulder, and elbow were reported <10% for the workers engaged in jewelry manufacturing. For the control group, these values were just above 10%. Therefore, these responses were not considered for further analysis. For the control group low back, neck, upper back, and wrist were the most affected body parts. 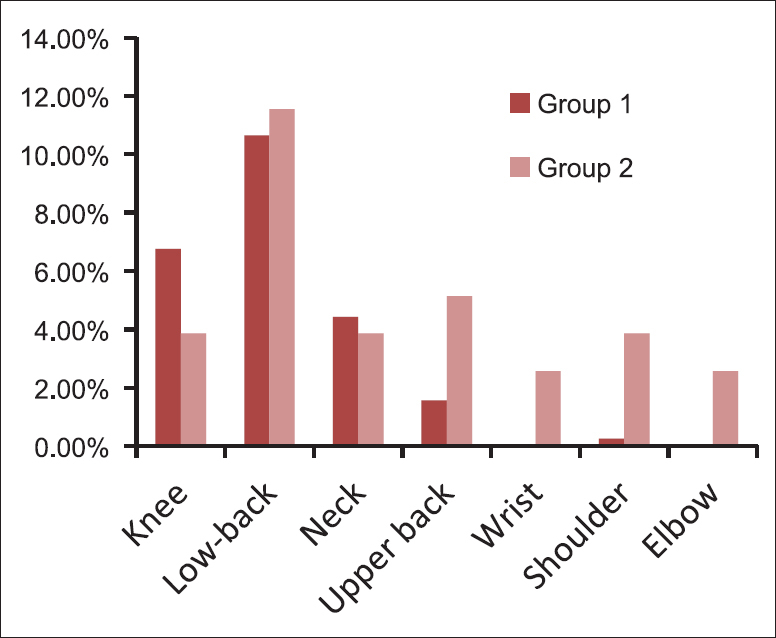 The prevalence rate of knee, low back and neck of both the groups were compared using statistical software NCSS 2004. The Chi-square tests were performed. The χ2 values for knee, low back and neck were 129.29, 37.09, and 6.17, respectively. The results of the Chi-square tests showed that the annual prevalence of knee (P < 0.001), low back (P < 0.001), and neck (P < 0.02) of the workers engaged in jewelry manufacturing were significantly higher than the control group. 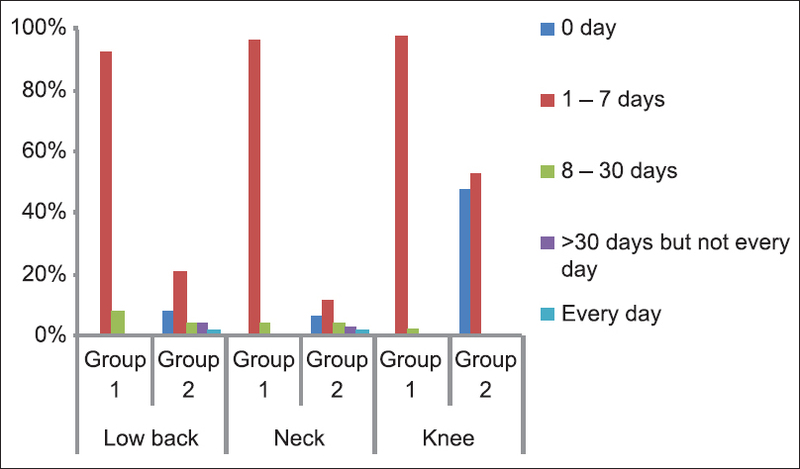 [Figure 2] represents the values of weekly prevalence data of musculoskeletal discomfort for both the groups (Group 1 - workers engaged in jewelry manufacturing, Group 2 - control group). The figure revealed that the responses for all the body parts were <10% or just above 10%. Therefore, further analyses were not been conducted. 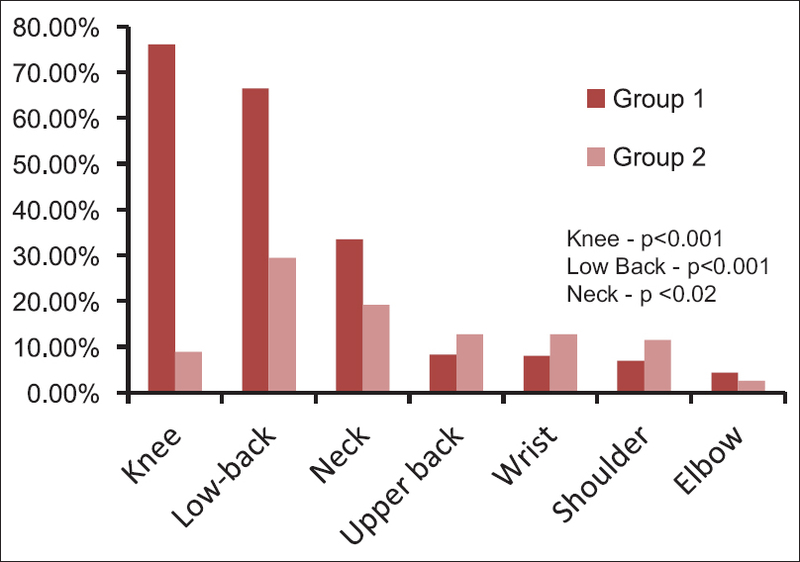 The prevalence data of the present study of low back, neck, and knee were compared with the data available in literature and presented in [Table 1] [Table 2] [Table 3]. The above result [Table 1] revealed that the annual prevalence of low back pain of the present study significantly higher in most of the cases as compared to other literature. Result of weekly prevalence is lower than the values reported in the literature. The above table revealed that the annual prevalence of neck pain of the present study in some cases significantly lower and in some cases significantly higher as compared to other literature. Result of weekly prevalence is significantly lower. The above table revealed that the annual prevalence of knee pain of the present study mostly significantly higher as compared to other literature. Result of weekly prevalence is comparable with the literature. The result of the NMQ revealed that no one was absent from work due to discomfort or pain in any part of the body (neck, back, shoulder, elbow, wrist or knee). From the questionnaire analysis, it was observed that the daily work was perceived by the workers engaged in jewelry manufacturing (100%) as the main activity which resulted in the development of low back, neck, and knee discomfort or pain. No one reported any kind of accident caused musculoskeletal discomfort or pain in the respective body parts, whereas, the respondents of the control group informed that the discomforts at neck were due to work (20%), activities at home (40%), supporting activity (10%), and other reasons (30%). For low back pain, these responses were work (45%), activities at home (25%), supporting activity (30%), and other reasons (40%). For the knee, the responses were work (10.53%), activities at home (36.82%), accident (42.11%), and other reasons (20.99%). 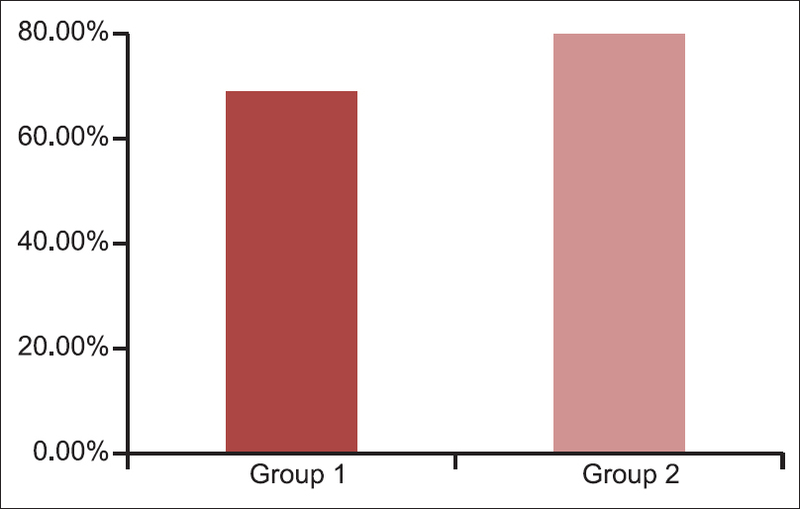 [Figure 3] represents the frequency of discomforts at low back for both the groups. It revealed that the workers engaged in jewelry manufacturing perceived low back discomfort mostly (93.44%) "one or more times a week" (odds ratio [OR] - 68.37, confidence interval [CI] - 26.53-176.19), whereas control group experienced low back discomfort mostly "one or more times a year" (37.93%). Workers engaged in jewelry manufacturing did not experience any discomfort or pain in low back "daily" or "only one episode of trouble." [Figure 4] presents the frequency of the discomfort at the neck region. It showed similar kind of results as observed in low back discomfort. For neck, the workers engaged in jewelry manufacturing experienced pain or discomfort mostly "one or more times a week" (OR - 57.35, CI - 22.56-145.78). The workers engaged in jewelry manufacturing didn't experience the pain or any discomfort at neck "daily," whereas, control group experience "one or more times a month" (20%), "one or more times a year" (20%), "one or more times every few year" (5%), and "only one episode of trouble" (30%). 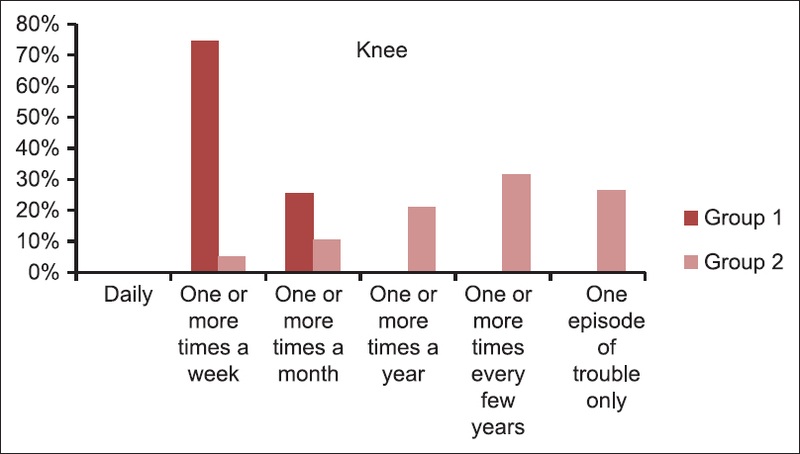 [Figure 5] presents the frequency of the discomfort at knee region. For knee, the workers engaged in jewelry manufacturing experienced mostly pain or discomfort, "one or more times a week" (OR - 119.39, CI - 30.579-97.62). Both the groups didn't experience the pain or any discomfort at knee "daily." The result of the severity of musculoskeletal discomfort is presented in [Figure 6]. The above figure showed that 82.24% of the workers engaged in jewelry manufacturing (Group 1) experience "mild" low back pain. 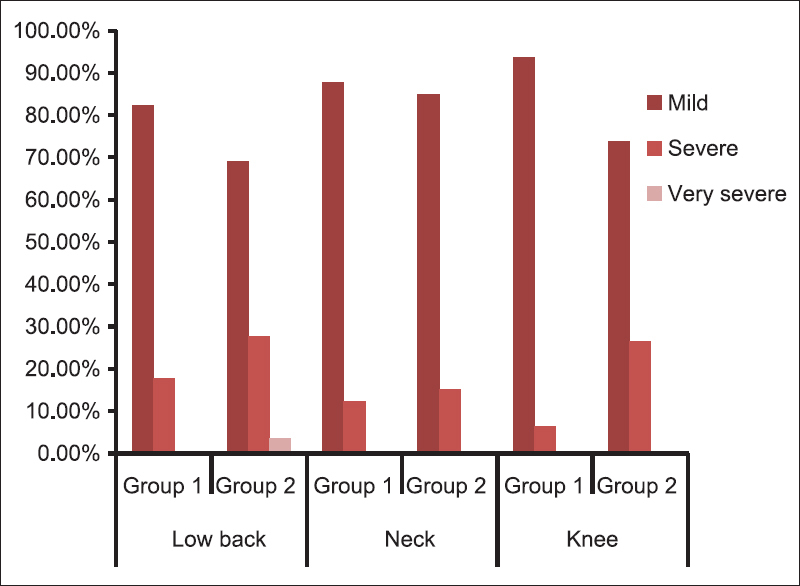 On the contrary, 68.97% among the control group (Group 2) experience "mild" low back pain. Statistical treatment showed that the difference was significant (OR - 2.08, CI - 1.07-4.05). For neck pain majority of the subjects of both the groups experience "mild" pain/discomfort (OR - 1.16, CI - 0.56-2.82). The result of the severity of the knee discomfort showed that the majority of the workers engaged in jewelry manufacturing has "mild" knee pain (OR - 5.377, CI - 2.13-13.56). This study was also carried out to find out the total length of the discomfort suffered by both the groups during last 12 months. The result [Figure 7] revealed that the workers engaged in jewelry manufacturing were experienced discomfort in the low back (OR -46.32, CI - 19.21-111.72), neck (OR - 204.08, CI - 60.52-688.17), and knee (OR - 38.23, CI - 9.76-149.73) for "1-7 days," whereas, for control group these values for "1-7 days" discomfort were 20.51%, 11.54%, and 52.63%, respectively. No one from the workers engaged in jewelry manufacturing experience any discomfort (low back, neck, and knee) for "more than 30 days" or "every day." For physical examination neck, low back and knee were considered. The results of modified NMQ revealed that the discomfort or pain in shoulder, upper back, wrist, and elbow regions were not observed to be severe among the workers engaged in jewelry manufacturing. The annual and weekly prevalence rates of shoulder were 7.01% and 0.26%, respectively. For upper back, the values were 8.31% and 1.56%, respectively. For wrist and elbow also similar results were observed. Therefore, it may be concluded that all these body parts were not much affected and were not included in the further study. 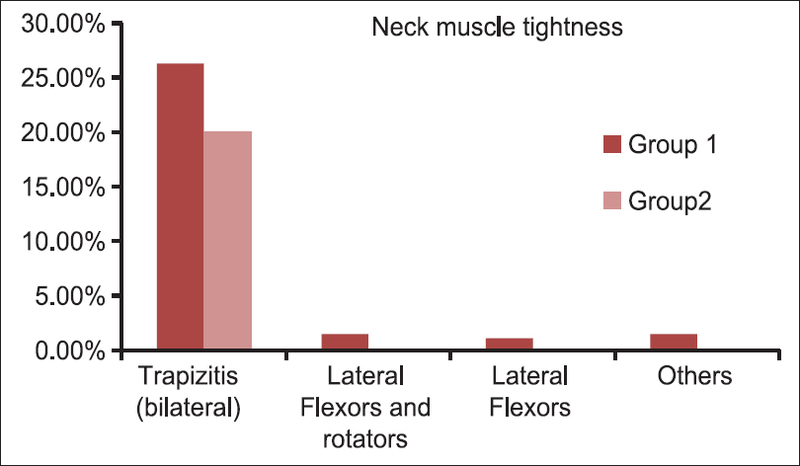 Majority of the workers engaged in jewelry manufacturing had full ROMs (neck flexors - 99.25%, extensors - 98.50%, lateral flexors (right) - 64.42%, lateral flexors (left) - 64.42%, lateral rotators (right) - 98.50%, and lateral rotators (left) - 98.50%). For the control group also similar values were observed. The ROM for lateral flexor (left and right) of the workers engaged in jewelry manufacturing was significantly lower than that of control group (OR - 27.06, CI - 6.29-116.37) [Figure 8]. Strength testing of neck muscle groups showed that all muscle groups had "grade 5" strength for both the groups (the workers engaged in jewelry manufacturing and the control group). 68.91% workers engaged in jewelry manufacturing and 80.00% of the control group had flexible neck muscles without any tightness (OR - 1.80, CI - 0.94-3.45) [Figure 9]]. About 31.09% and 20.00% respondents from the workers engaged in jewelry manufacturing and control group, respectively, had tightness in the neck muscles. The result of the tightness of the neck muscles were presented in [Figure 10]. It revealed that the workers engaged in jewelry manufacturing had higher level of bilateral trapizitis tightness, although the difference was not statistically significant (OR - 1.44, CI - 0.74-2.78). Among the other types of tightness, lateral flexors, and lateral rotators tightness were present among the workers engaged in jewelry manufacturing, which were absent among the control group. 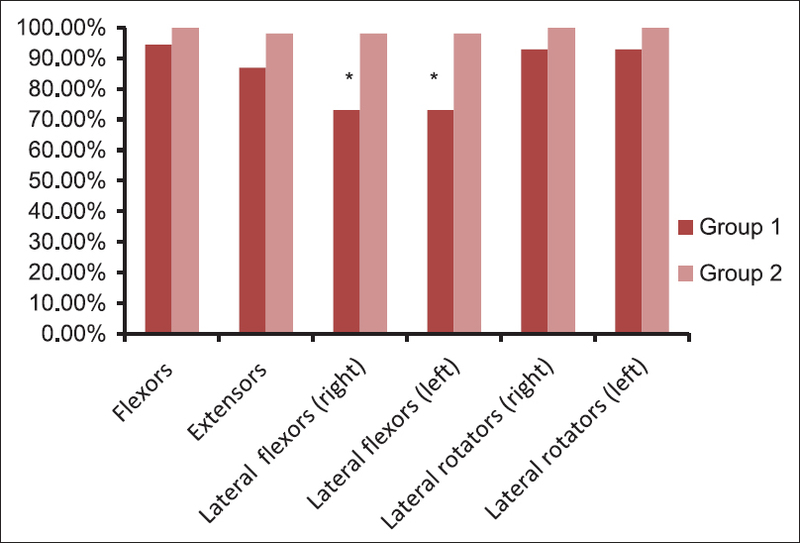 Majority of the workers engaged in jewelry manufacturing had full ROMs (back flexors - 94.38%, extensors - 86.89%, lateral flexors (right) - 73.03%, lateral flexors (left) - 73.03%, lateral rotators (right) - 92.88%, and lateral rotators (left) - 92.88%). 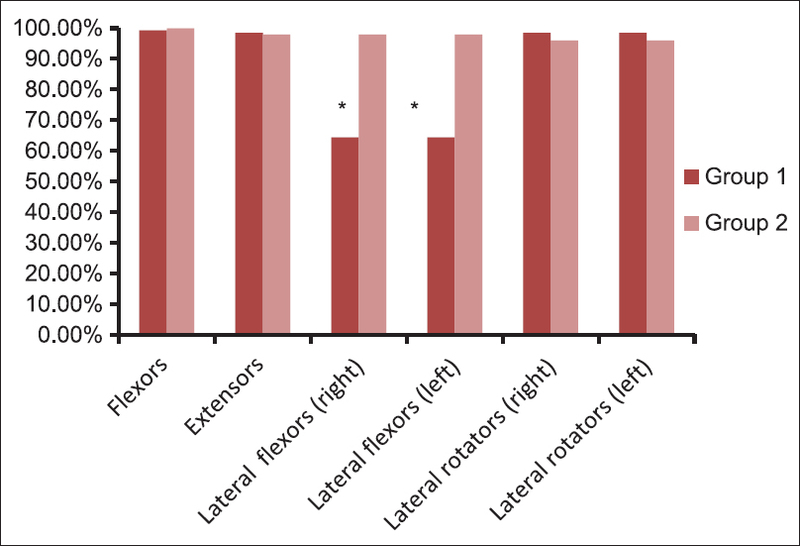 For control group also similar values were observed (back flexors - 100.00%, extensors - 98.00%, lateral flexors (right) - 98.00%, lateral flexors (left) - 98.00%, lateral rotators (right) - 100.00% and lateral rotators (left) - 100.00%). The values of full ROM for lateral flexors (left and right) of the workers engaged in jewelry manufacturing were significantly lower than that of control group (OR - 18.09, CI - 4.17-78.55) [[Figure 11]. Muscle strength testing showed that there was a reduction of strength of back extensors. However, the strength of back flexors, lateral flexor (right and left), and rotators (right and left) were at "grade 5" that is normal. From the [Figure 12], it was observed that there were significantly (OR - 2.02, CI - 1.12-3.55) less numbers of workers engaged in jewelry manufacturing, who are having back extensor's strength in good to normal range. It was also revealed that the workers engaged in jewelry manufacturing were having significantly (OR - 1.99, CI - 1.13-3.50) more number of respondents with back extensor's strength in the range of "fair." The data of back extensor's strength also showed that none of the subjects (workers engaged in jewelry manufacturing and control group) had back extensor strength values in the categories of "poor," "trace" and "no movement." Therefore, it may be concluded that the back extensor strength of the workers engaged in jewelry manufacturing were reduced substantially, but it had not been reduced to the level of disability. [Figure 13] revealed that 84.64% subjects of the workers engaged in jewelry manufacturing had full flexibility of back muscles, whereas, none of the subjects of the control group had tightness of the back muscles. Therefore, the result further suggested that 15.36% workers engaged in jewelry manufacturing have had tightness of the back muscles and they were the affected group. Physical examination showed that both of the groups had full ROM of the knee joints. 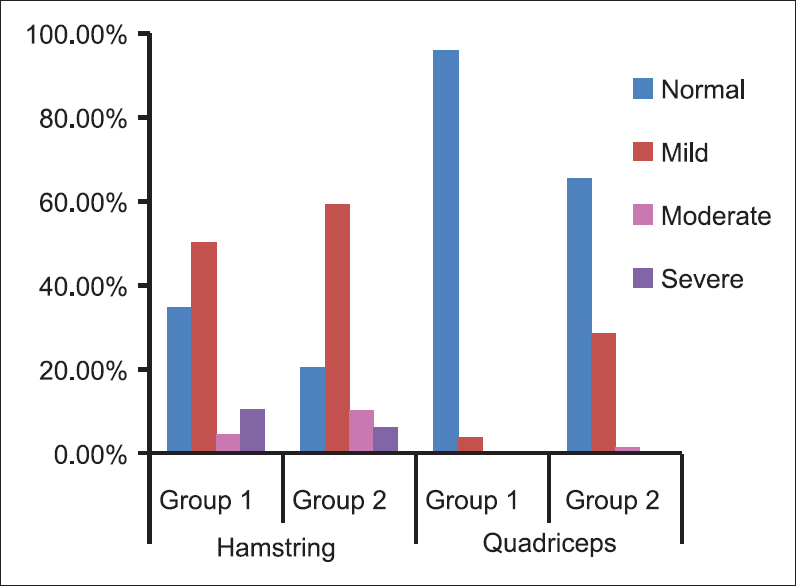 Results of tightness of leg muscles (hamstring and quadriceps) presented in [Figure 14]. It revealed that 34.83% of the workers engaged in jewelry manufacturing and 20.41% of the control group had "normal" flexibility of the hamstring muscle group. Approximately, half of the population of both the groups (workers engaged in jewelry manufacturing and control) had "mild" tightness in the hamstring muscle group (OR - 0.70, CI - 0.40-1.22). The result also revealed that the workers engaged in jewelry manufacturing had a higher percentage of respondents, who had "severe" tightness in the hamstring muscle group. However, statistical result showed that the difference was not significant (OR - 1.80, CI - 0.64-5.08). The result of the tightness of the quadriceps muscle groups showed that the workers engaged in jewelry manufacturing had significantly higher quadriceps tightness (OR - 12.36, CI - 4.26-35.99). The control group had significantly more numbers of subjects, who had "mild" tightness in the quadriceps muscle group (OR - 10.29, CI - 3.36-31.56). Annual prevalence results revealed that almost two third of the workers engaged in jewelry manufacturing were complaining about the low back pain. The result was compared with different studies available in the literature which showed that the annual prevalence data varied from 18% to 66.7%. ,,,,,,,,,,, The comparable work groups were office workers, computer operators, carpenters involved in finishing, bank officers, carpet weaver, workers in communication company. It revealed that the workers engaged in jewelry manufacturing had a high prevalence (66.49%) of low back pain. Weekly prevalence data available in the literature are very rare. The literature showed that the weekly prevalence data varies from 4.5% to 30.3%. ,, The present study showed that the weekly prevalence data (10.65%) for low back was also comparable to the data available in the literature. Chyuan et al. found in their study that the observed work population (workers of hotel and restaurant) experience low back pain "2-3 times" (30.9%) and "more than 3 times a week" (29.6%). In another study carried out by Atlas More Details et al. showed that the jeepney drivers experience mainly "1-7 days" pain during last 12 months. 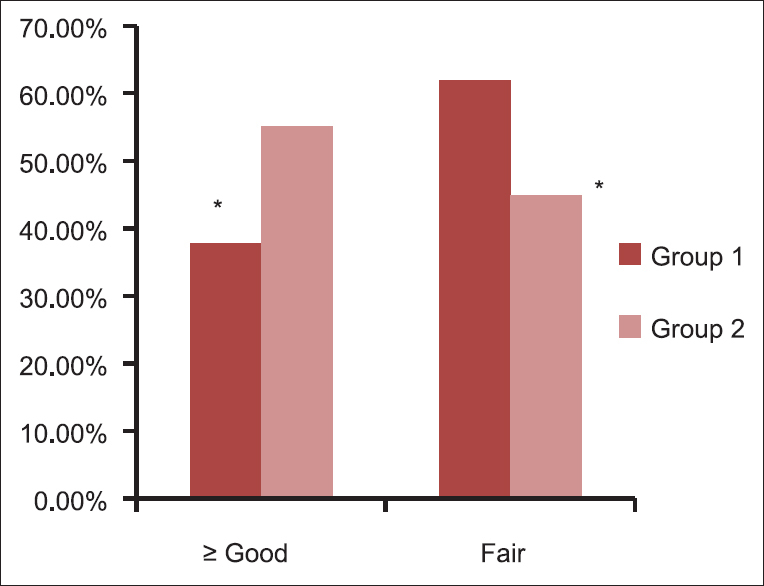 Similar kind of responses was also obtained in a study carried out by Alrowayeh et al. In the present study, a large number of the subjects (93.44%) indicated that they were experiencing back troubles one or more time a week. This suggests more number of respondents having similar problems. The study revealed that workers were suffering from the back problem; frequencies of such episodes were on higher side. The severity of the problem may categorize as mild, which was corroborated by the physical examination. ROM of the back muscles for majority of the workers was within the normal range. Strength of back extensors of none of the workers was found to be poor and below, even though, a substantial percentage (OR - 1.99, CI - 1.13-3.50) of the workers had a reduced back strength at fair level (grade 3). Thus, it can be stated that the workers engaged in jewelry manufacturing were suffering from back related problems even though, it was not severe in nature. 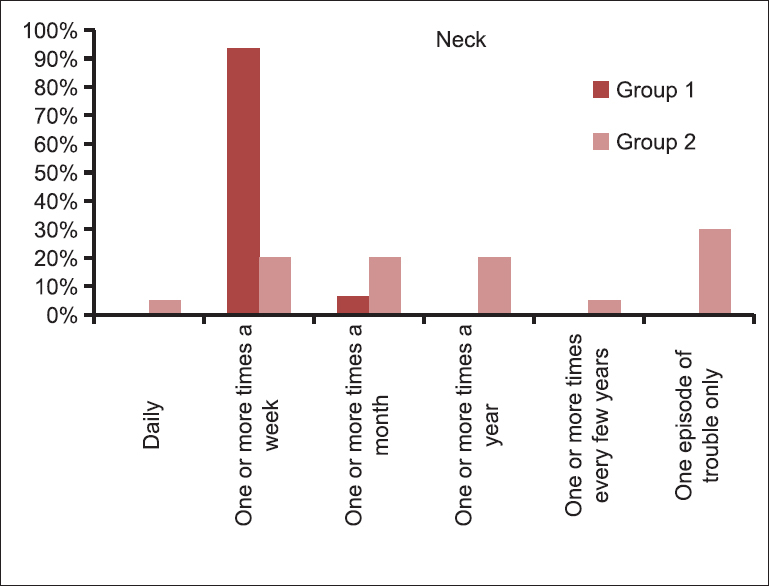 Annual prevalence rate reported in literature showed that the neck pain varied from 9.1% to 64.7% among the office workers, finishing workers of the carpentry, data processing workers, bank workers, ,,,,,, whereas, the availability of the weekly prevalence data of neck pain is rare and varies from 21% to 27%. In the present study, annual and weekly prevalence were observed to be 33.51% and 3.85% for jewelry manufacturing workers and control group, respectively. In the present study, responses were mild (87.68%). The physical examinations of the neck muscles also corroborated with this finding. It revealed that the ROM, strength, and tightness of the neck muscles were within the normal range. Chee and Rampal carried out a study on bank office workers reported that annual prevalence of knee pain was 31.9%. In some other studies on office workers, computer operators, papad makers the value varied from 12% to 30%. In another study, on the carpet menders who carry out their job in seated cross-legged posture (similar to the posture adopted by the workers of the present study) showed the annual prevalence of knee pain as 23.6%. , In the present study, such values were observed to be 76.10%. Back was an area of concern as the majority of the respondents were complaining about the low back, which was supported by the physical examination. However, problems did not result in any disability. Even though workers were reported neck troubles, but problems were "mild" in nature which was supported by physical examination. The self-reported responses for knee prevalence showed higher values than the other comparable group although; the physical examination revealed that the severity of the knee was not predominant. Results were compared with the control group and with the data available in the literature. The problems were found to be specific to the occupation. Almost all the workers had indicated that low back, neck, and knee problems were due to their work and not due to other causal factors. Bernard B. Musculoskeletal Disorders and Workplace Factors: A Critical Review of Epidemiologic Evidence for Work-related Musculoskeletal Disorders of Neck, Upper Extremity, and Low Back. Cincinnati: Department of Health and Human Services (NIOSH); 1997. p. 97-141. Gatchel RJ, Musculoskeletal Disorders: Primary and Secondary Interventions. Journal of Electromyography & Kinesiology. 2004;14: 161-70. Osborne RH, Nikpour M, Busija L, Sundararajan V, Wicks IP. Prevalence and cost of musculoskeletal disorders: A population-based, public hospital system healthcare consumption approach. J Rheumatol 2007;34:2466-75. Gatchel RJ, Musculoskeletal Disorders: Primary and Secondary Interventions. Journal of Electromyography and Kinesiology. 2004;14: 161-70. Oh IH, Yoon SJ, Seo HY, Kim EJ, Kim YA. The economic burden of musculoskeletal disease in Korea: A cross sectional study. BMC Musculoskelet Disord 2011;12:157. Kuiper JI, Verbeek JH, Everts V, Straub JP, Frings-Dresen MH. Serum markers of collagen metabolism: Construction workers compared to sedentary workers. Occup Environ Med 2005;62:363-7. Andersson BJ, Ortengren R, Nachemson AL, Elfström G, Broman H. The sitting posture: An electromyographic and discometric study. Orthop Clin North Am 1975;6:105-20. Videman T, Nurminen M, Troup JD 1990 Volvo Award in clinical sciences. Lumbar spinal pathology in cadaveric material in relation to history of back pain, occupation, and physical loading. Spine (Phila Pa 1976) 1990;15:728-40. HSE-Health and Safety Executive. Seating at Work. Norwich: Her Majesty's Stationary Office; 1997. p. 1-34. European Agency for Safety and Health at Work. Promoting Occupational Safety and Health Research in the EU. Forum 15. Bilbao: Spain; 2005. p. 1-8. Frazer MB, Norman RW, Wells RP, Neumann PW. The effects of job rotation on the risk of reporting low back pain. Ergonomics 2003;46:904-19. India Brand Quality Foundation. Available from: http://www.ibef.org. [Last accessed on 2011 Apr 03]. Hales T, Grant KA, Daniels W, Habes DJ. Hazard Evaluation and Technical Assistance Report. U.S. Department of Health and Human Services, Public Health Service, Centers for Disease Control, National Institute for Occupational Safety and Health, 1991, NIOSH Report No. HHE 90.273.2130. Deadwood, SD, Cincinnati, OH: FL Thorpe and Co., Inc.; 1991. National Institute for Occupational Safety and Health. Elements of Ergonomics Programs a Primer Based on Workplace Evaluations of Musculoskeletal Disorders, NIOSH Publication No. 97-117; 1997. Available from: http://www.cdc.gov/niosh/docs/97-117/epchklst.html. [Last accessed on 2011 Mar 02]. Jayprakash K. Acquired methaemoglobinemia (Met Hb) in goldsmiths - A hitherto unobserved occupational hazard. Indian J Occup Environ Med 2003;7:16-8. Untimanon O, Pacharatrakul W, Boonmeepong K, Thammagarun L, Laemun N, Taptagaporn S, et al. Visual problems among electronic and jewelry workers in Thailand. J Occup Health 2006;48:407-12. Patil AJ, Bhagwat VR, Patil JA, Dongre NN, Ambekar JG, Das KK. Occupational lead exposure in battery manufacturing workers, silver jewelry workers, and spray painters in western Maharashtra (India): Effect on liver and kidney function. J Basic Clin Physiol Pharmacol 2007;18:87-100. Ghosh T, Das B, Gangopadhyay S. Work-related musculoskeletal disorder: An occupational disorder of the goldsmiths in India. Indian J Community Med 2010;35:321-5. Crawford JO, Laiou E, Spurgeon A, McMillan G. Musculoskeletal disorders within the telecommunications sector - A systematic review. Int J Ind Ergon 2008;38:56-72. Dickinson CE, Campion K, Foster AF, Newman SJ, O'Rourke AM, Thomas PG. Questionnaire development: An examination of the Nordic Musculoskeletal questionnaire. Appl Ergon 1992;23:197-201. Lifshitz Y, Armstrong T. A Design Checklist for Control and Prediction of Cumulative Trauma Disorders in Hand Intensive Manual Jobs, Proceedings of the 30 th Annual Meeting of Human Factors Society. 1986. p. 937-41. Putz-Anderson V. Cumulative Trauma Disorders: A manual for musculoskeletal diseases of the upper limbs, National Institue for Occupational Safety and Health. Cincinnati, Ohio, USA: Taylor and Francis; 1988. p. 1119-567. Hillman M, Wright A, Rajaratnam G, Tennant A, Chamberlain MA. Prevalence of low back pain in the community: Implications for service provision in Bradford, UK. J Epidemiol Community Health 1996;50:347-52. Lemasters GK, Atterbury MR, Booth-Jones AD, Bhattacharya A, Ollila-Glenn N, Forrester C, et al. Prevalence of work related musculoskeletal disorders in active union carpenters. Occup Environ Med 1998;55:421-7. Chee HL, Rampal KG. Work-related musculoskeletal problems among women workers in the semiconductor industry in Peninsular Malaysia. Int J Occup Environ Health 2004;10:63-71. Spyropoulos P, Papathanasiou G, Georgoudis G, Chronopoulos E, Koutis H, Koumoutsou F. Prevalence of low back pain in greek public office workers. Pain Physician 2007;10:651-9. Omokhodion FO, Sanya AO. 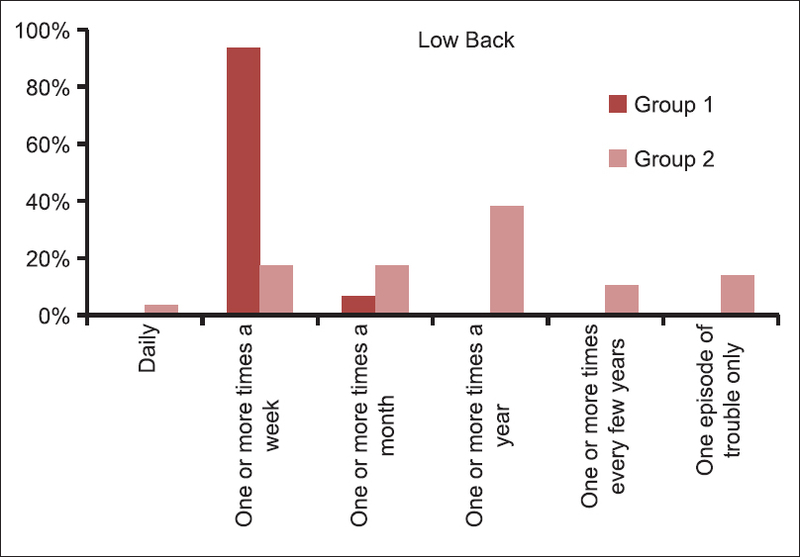 Risk factors for low back pain among office workers in Ibadan, Southwest Nigeria. Occup Med (Lond) 2003;53:287-9. Chyuan JY, Du CL, Yeh WY, Li CY. Musculoskeletal disorders in hotel restaurant workers. Occup Med (Lond) 2004;54:55-7. Woods V. Musculoskeletal disorders and visual strain in intensive data processing workers. Occup Med (Lond) 2005;55:121-7. Choobineh A, Hosseini M, Lahmi M, Khani Jazani R, Shahnavaz H. Musculoskeletal problems in Iranian hand-woven carpet industry: Guidelines for workstation design. Appl Ergon 2007;38:617-24. Choobineh A, Tabatabaei SH, Tozihian M, Ghadami F. Musculoskeletal problems among workers of an Iranian communication company. Indian J Occup Environ Med 2007;11:32-6. Karimfar MH, Shokri S, Gholami MR, Bayat A, Moosavinasab N, Choobineh A. Musculoskeletal Problems among Workers of an Iranian Zinc Industry. Pak J Biol Sci 2008;11:2670-4. Akrouf QA, Crawford JO, Al-Shatti AS, Kamel MI. Musculoskeletal disorders among bank office workers in Kuwait. East Mediterr Health J 2010;16:94-100. Atlas AP, David JA, Erese RR, Alejandrino PM, de Claro MC, Agawa RA. Prevalence of low back pain among Jeepney drivers in metro manila: A descriptive study. Philipp J Allied Health Sci 2006;1:56-7. Alrowayeh HN, Alshatti TA, Aljadi SH, Fares M, Alshamire MM, Alwazan SS. Prevalence, characteristics, and impacts of work-related musculoskeletal disorders: A survey among physical therapists in the State of Kuwait. BMC Musculoskelet Disord 2010;11:116. Klussmann A, Gebhardt H, Liebers F, Rieger MA. Musculoskeletal symptoms of the upper extremities and the neck: A cross-sectional study on prevalence and symptom-predicting factors at visual display terminal (VDT) workstations. BMC Musculoskelet Disord 2008;9:96. Chiu TT, Leung AS, Lam P. Neck pain in Hong Kong: A telephone survey on consequences and health service utilization. Spine (Phila Pa 1976) 2010;35:E1088-95.